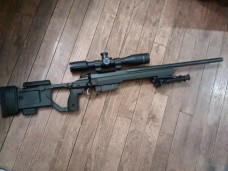 The Whiskey-3 Chassis (W3C) (Generation 4 Chassis) is a highly functional, feature laden stock for the Tikka T3, Remington 700, and other rifles. The W3C combines precise aluminum “V” bedding with tool-less adjustments, (length-of-pull and cheek piece height), durability and excellent ergonomics. Right out of the box it allows the use of AICS style magazines (not included) in your rifle without any special bottom metal. Numerous types of accessories can be added to the many attachment points, including handstops, sling mounts, rails, bipods, monopods, and more. Our modular grip panels allow the shooter to tailor the fit of the stock to his/her hand which, combined with the other adjustments, yield a stock set up exactly as it needs to be for that particular shooter. X-Ray Chassis (Generation I Chassis) Unprecedented value… This is what the X-Ray chassis provides to you. When you pick up the chassis, it will feel nice and light compared to other chassis. You’ll have nearly identical ergonomics to the Whiskey-3 with only a little more time involved in adjusting the different aspects like the length of pull. Furthermore, you’ll have all the standard benefits of a chassis like the use of AICS magazines, a variety of mounting points for slings, barrier stops, etc., and V-bedding for the action while not having to sell off a kidney to pay the price of admission. To accomplish our design intent, we kept the features that everyone wants and needs and eliminated those that weren’t necessary. Then we utilized efficient manufacturing processes to keep production costs down and in turn keep the price to the shooter down. The end result is a hybrid aluminum and polymer chassis that we think you’ll love. We’re proud to present the X-Ray chassis, the result of years of careful design, thought, refinement, and hard work. All of our chassis take AICS magazines with nothing extra needed, the magazine is not included. X-Ray Chassis now come with the 1-3 LOP spacer kit which allows LOP up to 13.8″ approximately. Please Note: All of our chassis take AICS magazines with nothing extra needed, the magazine is not included.